As seen from Earth, the Sun appears to move around the Earth in a plane that is inclined 23.5 degrees to the Earth’s celestial equator, the plane formed by projecting the terrestrial equator into space. This plane is called the ecliptic and it also defines the plane in which, with some variations, all the planets in the solar system orbit the Sun. This is one piece of evidence for planetary formation starting from a disk of dust and gas orbiting around the Sun. Because all the planets orbit near this plane, they can appear close together in the sky at times. These visual close approaches are called ‘planetary conjunctions.’ The proximity of the planets is just an optical illusion. We measure the angular separation between two objects in degrees. For example, the “pointer stars” in the Big Dipper’s bowl are about 5 degrees apart. 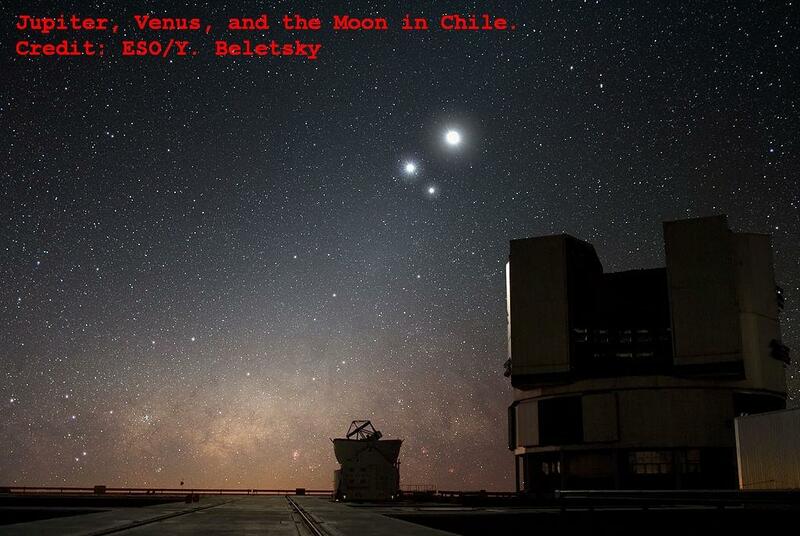 The next planetary conjunction visible to the naked eye is March 5 in the evening. Venus and Mercury will be slightly above the horizon after sunset and 1.5 degrees apart. In fact, Venus and Mercury will be within 5 degrees of each for much of March. Be sure to wait until AFTER sunset to look for Mercury and Venus. A list of planetary conjunctions in 2018 is available here. Note that some of these involve planets that are only visible with a telescope. The conjunction of the two largest planets, Jupiter and Saturn, occurs every 20 years. The next one is December 2020. The Moon can also be in conjunction with a planet. On March 18, the Moon, Mercury, and Venus will be 7 degrees apart for about one hour after sunset. Several science fiction movies involve the alignment of all eight (or even nine!) planets, where ‘alignment’ means a straight line could be drawn in space through all 8 planets. This alignment is impossible, because the orbits of the planets are not in exactly the same plane. The closest all eight planets can appear is about 30 degrees apart. This is roughly the distance across the Big Dipper. This last occurred in 561 BC and will next occur in 2492. Note that the alignment of planets can produce the occultation of one planet by another. In other words, one planet passes directly between Earth and the other planet. This happens VERY rarely. The next occurrence visible from land is in 2079 when Mercury will occult Mars.